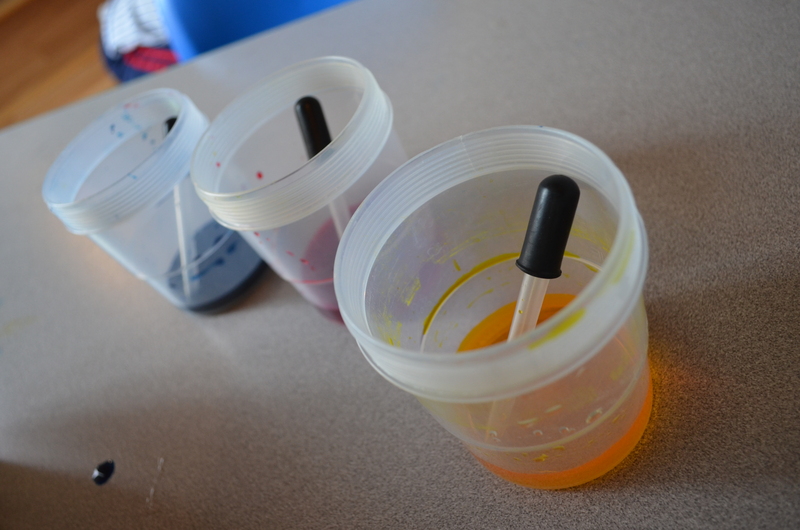 Color mixing is always one of my favorite units! Learning colors is a huge aspect of preschool curriculum, and there are so many great books and resources on them. You can talk about colors just about anywhere you are! 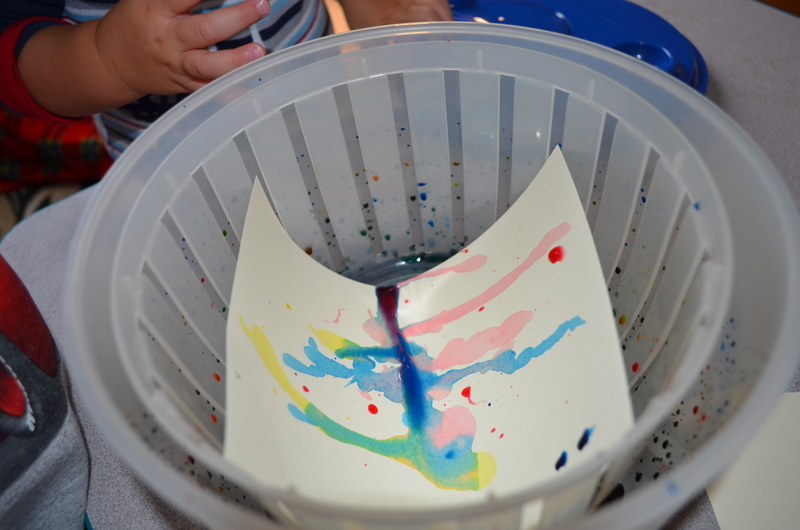 The idea of mixing two colors to form a new color is somewhat of a complex concept for preschoolers. While it may be easier to understand that red and white make pink, it’s just not as easy to remember that blue and red make purple. 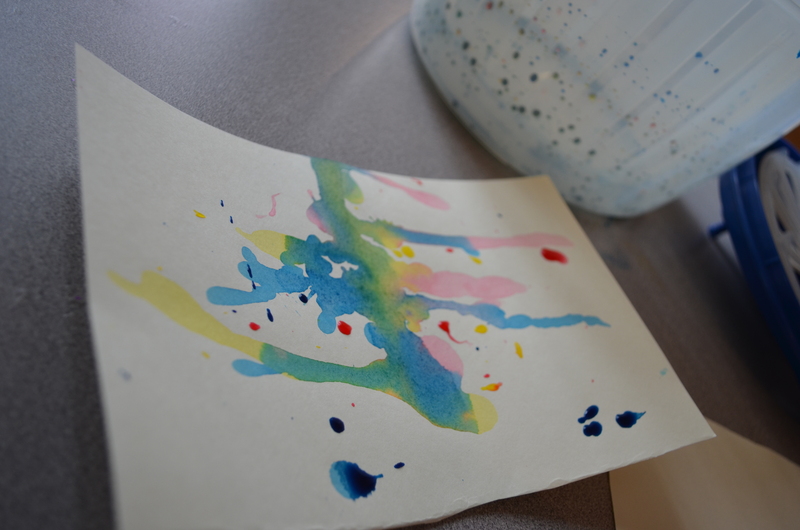 Whenever I do color mixing with young children, I try to make the process of learning one that is memorable. If we engage their senses in the process, then it becomes an even greater tool. 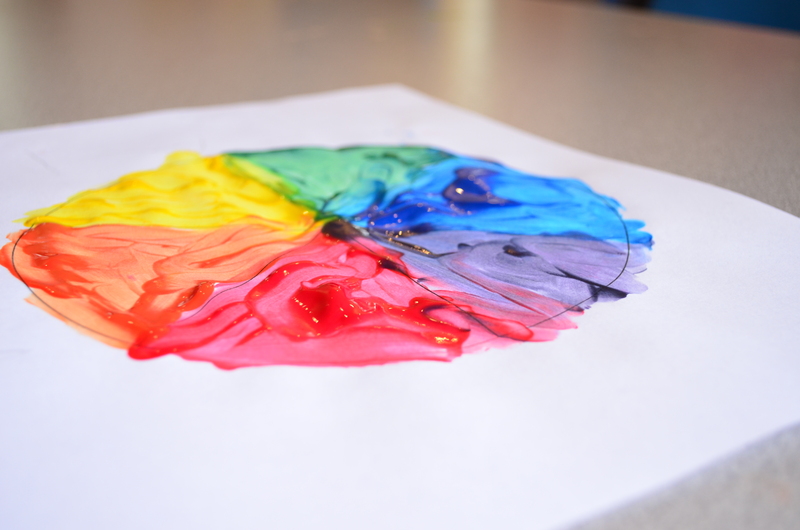 Here are some of our favorite and effective color mixing activities. 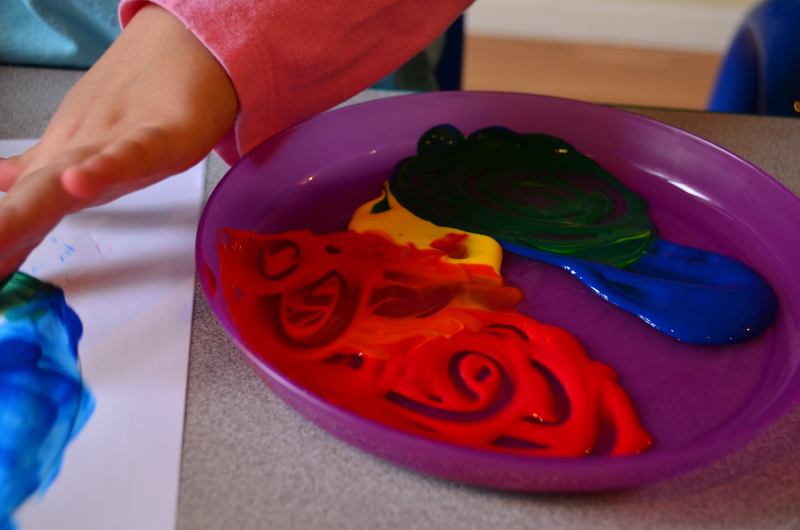 We found this fantastic foamy color mixing idea from Fun at Home With Kids. I started off with just pink and blue to make purple, then we made a second batch with yellow and blue to make green. 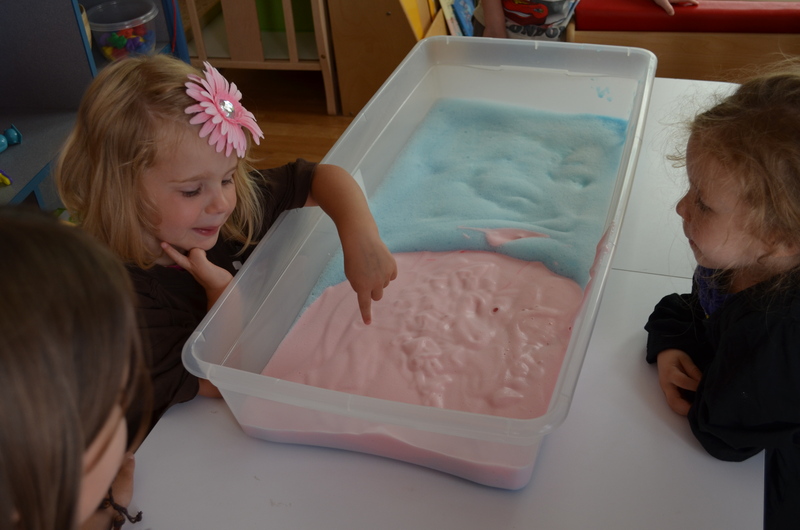 This has been one of our most exciting sensory projects ever, and afterward many of the kids loved talking about the different colors they created. A few minutes into the project I added spoons, ladles, measuring cups, etc. for the ones who wanted to participate but didn’t want to get foamy. 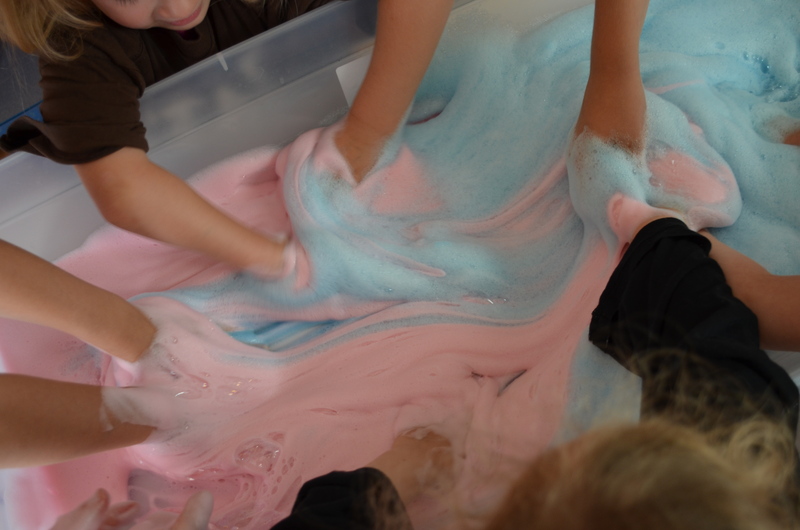 To make the soapy, foamy mixture, visit Fun at Home With Kids for the recipe. I tripled the recipe all at once to make one giant color. The fun lasts for about 45 minutes before it deflates. Initially I was only going to have three kiddos at this project at a time, but they were all so eager that I gave in and let all six do it at once. 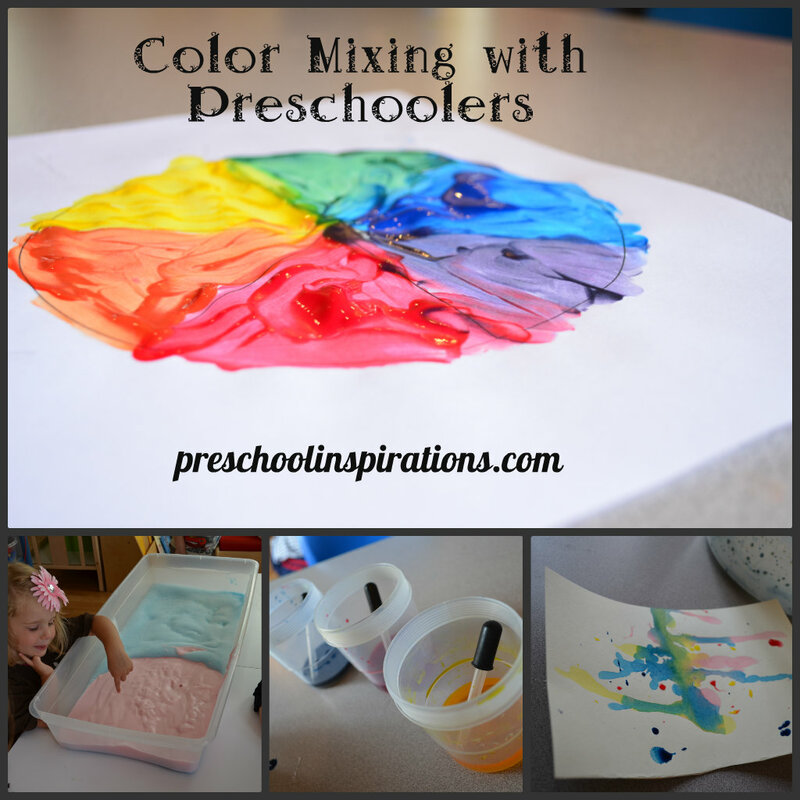 The next activity that was hugely successful in helping my class learn about color mixing is an idea that I saw at Teach Preschool. We finger painted color wheels, and I would say each child chose to participate in this for at least 25 minutes! 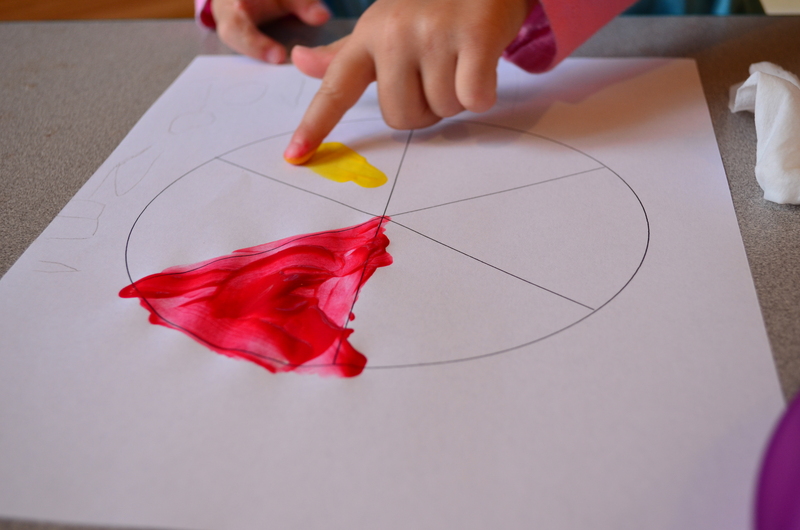 I printed off a color wheel for each child, and I put red, yellow, and blue on their painting plate. There was enough space in between each color to form a new color to be mixed. They painted the red, left a blank space, then painted yellow. 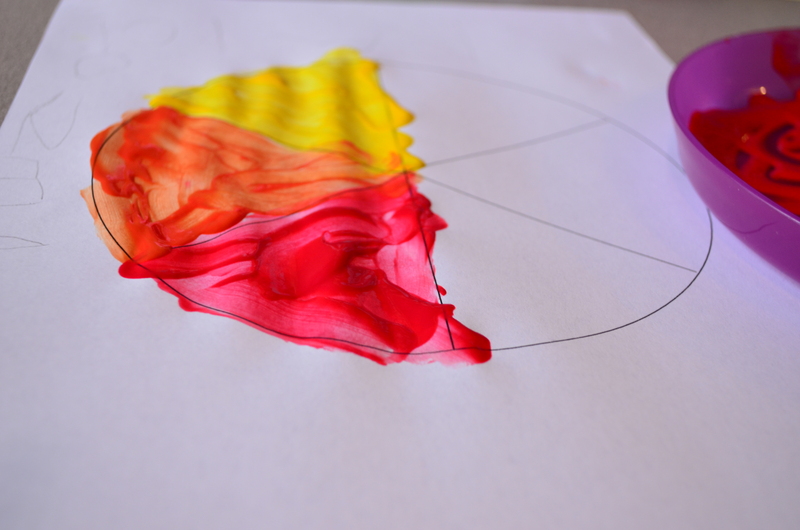 Then they mixed the red and yellow on their plate to make orange and added it to the color wheel. We continued this until we had red, orange, yellow, green, blue, and purple on the color wheel. I felt that this specific activity really sank into their minds and gave them a great understanding of color mixing — one that words could never do justice with. 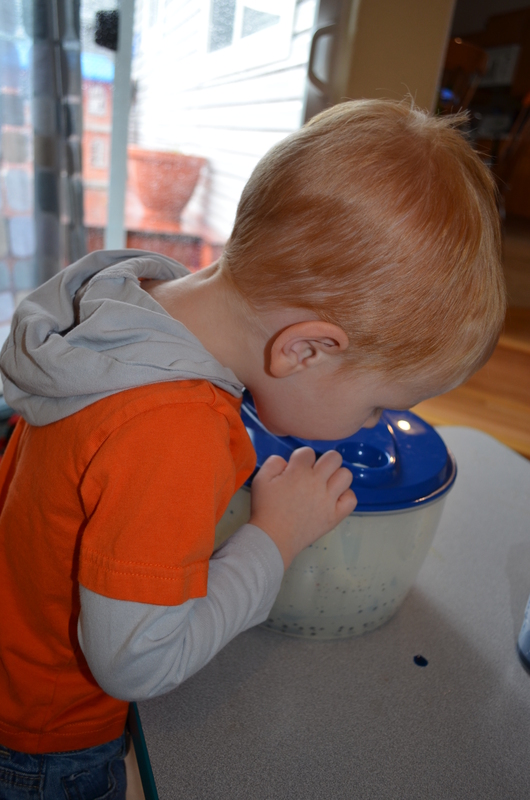 Lastly, we used a salad spinner to mix colors. My inspiration this time came from Scrumdilly-do! I set out three cups of liquid watercolor for each child to choose from. They used the droppers to put the desired color and number of drops onto their paper. Then it was time to spin! 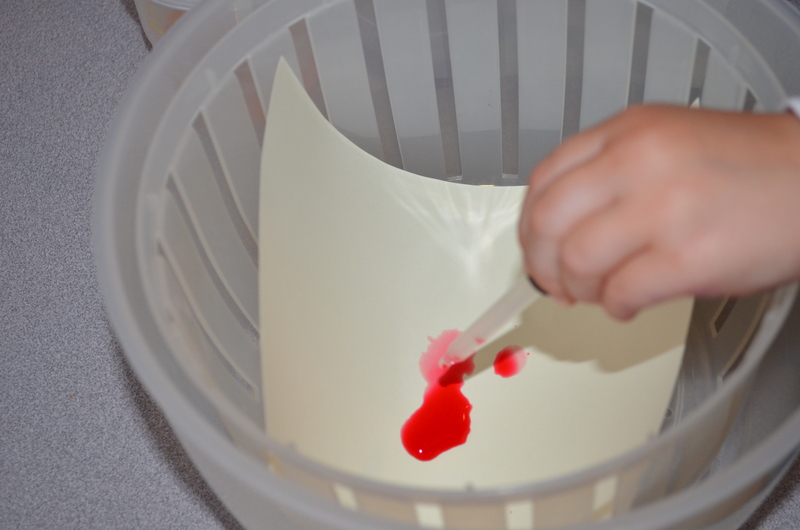 It was such a hit that even my younger preschoolers wanted to do this over and over and over. Since I have an in home preschool, it is super convenient to allow each of my students to make 2-3 different projects since my class size is much smaller than in a center preschool setting. Plus, then I can keep one to hang on the walls, and they can take some home which makes us both happy! 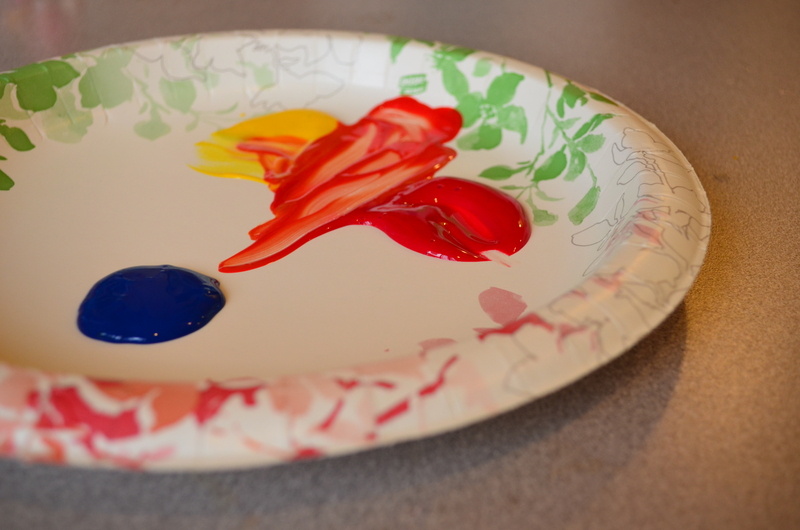 I would love to hear about some of your proven color mixing activities! I love your photos and love your post Katie! Thank you Deborah! We appreciate your incredible color wheel inspiration — we love all the great ideas you share! My daughter loves preschool so much because they let her do messy things like this which I try to keep to a minimum at home. These look like such fun activities. I should share them with her teacher. I’m so glad I put her in a pre-kindergarten program, I think it will make the transition to school a lot smoother. You are so right about the fun Staceybeck01!! And these activities can be so calming too. 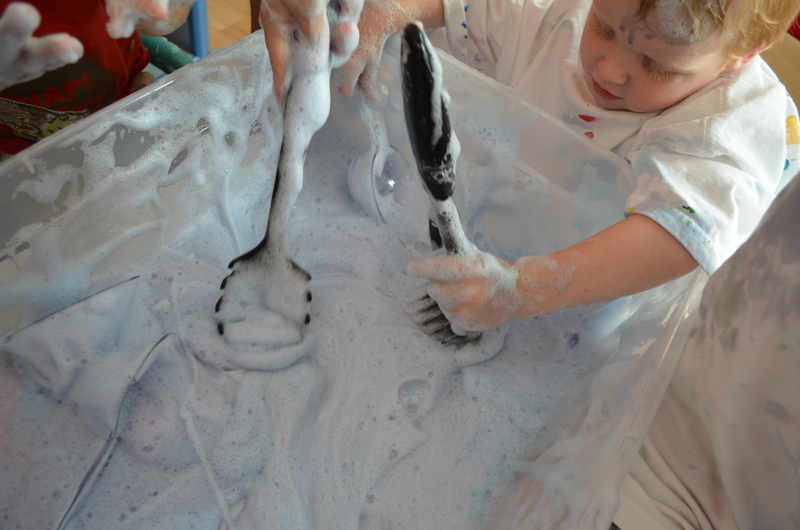 Art and sensory play are just amazing like that. It’s always so wonderful to hear about little ones who love their school. Thank you so much for visiting and sharing that!